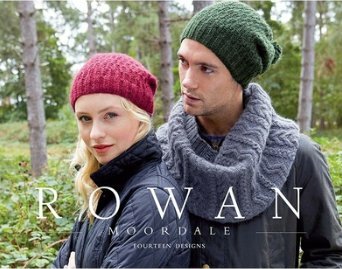 Capture the romance of the English Countryside with this gorgeous collection of timeless patterns by Martin Story featuring new Rowan Moordale. One of the most gorgeous yarn & pattern collection we have seen. Moordale embraces the romance of the English countryside with a British sourced & spun blend of soft, yet strong Bluefaced Leicester & Alpaca. The tender, yet robust yarn has beautiful stitch definition for cables & texture. The palette of earthy colorways combined with the timeless designs is simply inspiring. All of the Moordale patterns are available for purchase individually or the entire collection of 14 patterns with gorgeous color photography are showcased in the Moordale Collection Pattern Book. Shop the Moordale collection in-store or online. We hope you enjoy this collection as much as we do.